Most of us don’t follow fall fashion trends. We tend to slack off in fall but not again. Here are some basic fall trends that you need to fall in love with. Don’t stick to those boring plain dark shades and outfits this time. Fall is all about staying warm and a la mode, all at the same time. It’s time to experiment with layering, prints and basics. This year go shopping for some vogue and chic things and style them up. They never go out of trend. Ankle boots, knee high boots and high boots, they’re all chic. This fall get those boots that you always wanted. It’s always a good idea to own a pair of basic black boots but other than that you can also go for tan, brown or wine coloured ones. Wear them with dresses, skirts, shorts and what not. Wait, no! I’m not talking about those old soulless black stockings! Nope, I’m not even talking about those fishnet ones! They’re old school! Nah, not at all. I’m talking about the new printed stockings. 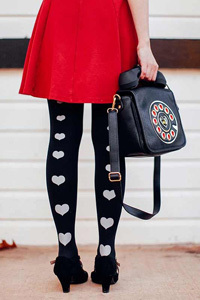 These days polka dotted, heart printed, striped and other printed stockings are in trend and they look a-ah-mazing! Nothing can beat those printed stockings with a skater dress! Obviously not your normal socks! Get rid of those this season! Get a snazzy pair of lace-trimmed edge socks or maybe a pair of over-the-knee socks. Play peek-a-boo with the lace-trimmed edge socks and show off only the edge of your socks and don’t forget to pair them with your boots. And if you don’t like stockings too much go for the over-the-knee socks. They happen to a chic alternative. Nope you won’t die in a crop top in cold weather! Why should you not wear what you love because of the weather? Crop tops can be worn in the cold season, too. All you need to do is pair ‘em well and carry a jacket! Get a thick sweatshirt crop top or maybe a woollen one and pair it with a high-waisted pant. It can’t get any better. That word just cheers me up ‘coz it reminds me of Harry Styles! Get the beanie like Harry Styles’ style! Beanies are the rage and they make you look cute. They don’t just look trendy, they also protect you on those cold days. Pick some nice colours and put them on! Punk Fashion: Make a statement! Punk rockers are complete rebels who always stand out with their style statement. Here are a few punk fashion must-haves. ← Diabetes in teenagers: Let’s halt the epidemic!